Withholding the correct amount of taxes from one’s paycheck for state and federal taxes has long been a challenge for taxpayers. However, the changes brought on by TCJA, such as the caps on state and local tax deductions and elimination of the personal exemption, have left many Americans even more uncertain about how to determine their tax liability and appropriately withhold for it. According to the Government Accountability Office, nearly 33 million people didn’t withhold enough taxes in 2018, which means 21% of Americans were stuck with an unwelcome (and it seems unexpected) tax bill. If you’ve been on Twitter or Facebook, chances are you’ve seen posts from disgruntled taxpayers who are frustrated as they find they are receiving smaller refunds, and in some cases, owing money for the first time. The lesson learned for estate and business planners is to minimize any surprises for clients when they file in 2020, so that when tax time rolls around your client isn’t stuck with an unexpectedly large tax bill. To do this, professionals should first educate their clients on the effects of TCJA (a study by NerdWallet shows that only 51% of Americans are even aware of the new tax law). Second, professionals should help clients calculate their 2019 tax liabilities and then adjust their withholdings accordingly. For tax years 2018-2025, the TCJA almost doubled the standard deduction amounts: $12,000 for singles, $24,000 for joint-filing married couples, and $18,000 for heads of households. While these new amounts may help some families, they can negatively impact others. For instance, families with no kids who do not itemize will significantly benefit from the increased deduction while those with several children will end up paying more in taxes. It works like this—in 2017, a family of four who filed jointly would have claimed four personal exemptions (4 x $4,050) and the standard deduction amount of $12,700, which would have reduced their taxable income by $28,900. In 2018, that same family would only be entitled to the standard deduction of $24,000. While the child tax credit has also increased from $1,000 to $2,000, this might not be enough to offset the loss, particularly if any of the family’s children are over the age of 17. What estate planners can do to help their clients with large families next tax season is to make sure they are taking advantage of the Credit for Other Dependents. This allows taxpayers to claim a $500 non-refundable credit for dependents in their household that don’t meet the definition of a qualifying child (such as college-aged children and parents). Want more educational content? 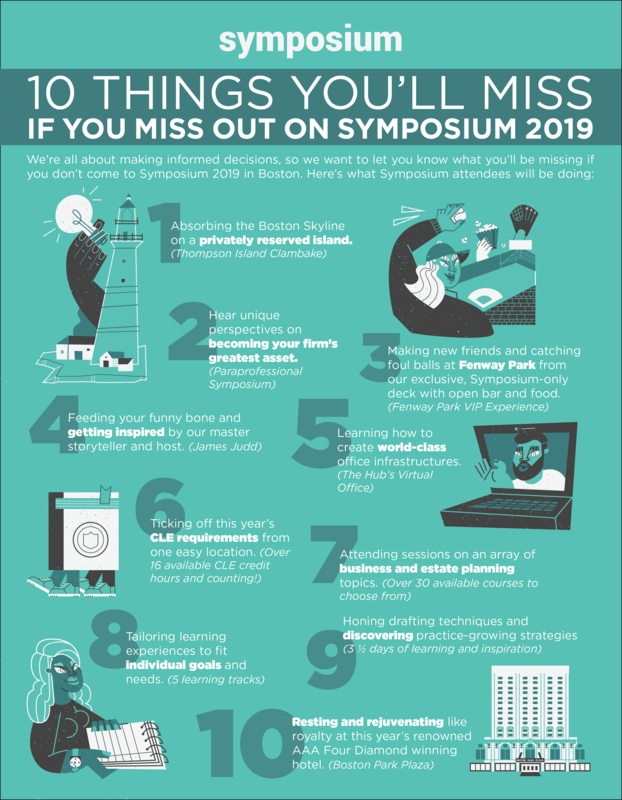 Then join us at Symposium 2019 in Boston, MA on July 31, 2019. Listen to industry leaders discuss a wide range of business and estate planning topics. Check out a full list of Symposium courses here. According to Forbes, the doubling of the standard deduction is estimated to lower charitable giving by $13 billion each year. Since many taxpayers will opt for the standard deduction instead of itemizing, they won’t be able to reap the tax benefits previously afforded to them. The TCJA allows for charitable deductions on cash donations of up to 60% of one’s AGI, however, this will mostly benefit wealthier taxpayers who can afford to give large cash donations. Use charitable giving to lessen other tax liabilities. Transfer appreciated stock or assets directly to a charity. While taxpayers may no longer be able to deduct the full fair market value of the asset donated, they can reap the benefit of not having to pay income taxes on the appreciated asset. Use the bunching strategy. For those whose deductions are on the edge of exceeding the standard deduction, they might benefit from a “bunching” strategy. Bunching means to consolidate charitable donations (and deductions) into certain years so that the standard deduction is exceeded to provide an incremental tax benefit. Donor-advised funds can be used to hold these charitable gifts until they are dispersed. While the 2018 tax season wraps up this week, it’s never too early to get a jump on advising clients for next year. Learn how a WealthCounsel membership can help keep you and your practice up to date and see our business and estate planning drafting software in action by scheduling a demo today.